Even if al-Qiq was treated it may not save his life. The Palestinian Prisoners’ Society on Wednesday said Israel was “not showing attention or willingness” to solve the case of Palestinian journalist Muhammad al-Qiq as he entered day 77 on hunger strike. The society reiterated that the Palestinian prisoner remained in critical condition, slamming Israel for failing to make serious steps in his case and holding Israeli authorities “completely responsible” for al-Qiq’s life. Al-Qiq, a 33-year-old and father of two, launched his hunger strike after being detained in November and held in Israeli prison under administrative detention without charge or trial. Over 100 Palestinians marched in solidarity with al-Qiq on Wednesday in front of HaEmek Hospital where the journalist is still being held under Israeli custody. Participants raised Palestinian flags and chanted slogans calling for al-Qiq’s release. The prisoner on Feb. 4 rejected an Israeli court decision to temporarily suspend his detention, which would resume once his health improved. Al-Qiq said that he would not end his strike unless Israel agreed to his full release. An independent doctor who visited al-Qiq in the hospital on the same day as the court decision said he appeared close to death, according to Physicians for Human Rights’ Israel branch (PHRI) who facilitated the visit. Even if al-Qiq was treated, the group added, it may not save his life. Following a four-day stint of forced treatment by Israeli doctors on al-Qiq in January, Palestinian leadership expressed concern that the practice would be used again as al-Qiq nears death. 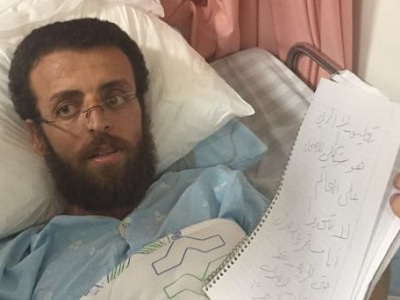 Despite two recommendations from HaEmek Hospital’s ethics committee advising that al-Qiq be forcibly treated again, Amnesty International reported that his medical team had so far decided to respect his wishes not to receive forced treatment again. Israel has negotiated in cases of hunger strikes launched by Palestinian prisoners in the past out of fear that prisoners’ death could spark unrest in the occupied Palestinian territory, but upheaval has already laid into the territory for months. Palestinian Prisoners’ Society head Qadura Fares said earlier this month that the Israeli security establishment now believes it has “nothing to lose” by failing to release al-Qiq before his death.